The word HORN is often used as a generic term for any brass instrument. In brass band instrumentation the horn section is comprised of upright saxhorns pitched in E-flat, called “tenor horns” or “alto horns”. The most common configuration is the strict upright, with the bell facing upward. Occasionally, bell-front horns are seen (most commonly in bands that do a lot of marching). Three piston valves are standard on the E-flat tenor horn. Many newer horns are being made with triggers to help compensate for the inherent tuning issues faced by all brass instruments. The E-flat tenor horn is considered one of the “mellow” instruments in the brass band. In four-part arrangements, the horn is used for the alto and tenor voices. Because the range of the horn is between the brighter-sounding cornets and trombones, the darker sound is sometimes difficult to hear. However, the horn sound is a key component of the overall sound of a brass band, anchoring the “middle” of the band. The horn is used as a solo instrument, although not as frequently as the cornet or euphonium. Most horn solos are of the more melodic type, although some good technical solos exist. The orchestral French horn is built on a circular pattern, and is played with the bell facing down and toward the rear. 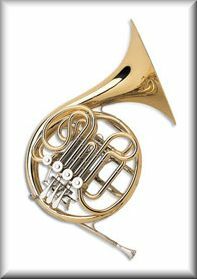 The modern French horn is usually a double horn, pitched in F and B-flat, with three rotary valves, and a fourth valve that switches between the F and B-flat halves of the horn. Unlike most brass instruments, the valves are operated with the left hand. The right hand is positioned in the flare of the bell, and is used to partially control the pitch and sound of the instrument. The mouthpiece of the French horn is smaller than that of the tenor horn, and the flare of the bell is considerably greater. The tubing of a French horn is longer than that of the tenor horn (the length of the fundamental tube of an F horn is the same as that of an F tuba). 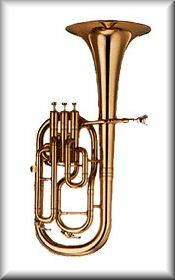 The long fundamental tube of the French horn, coupled with the small diameter of the mouthpiece, mean that the French horn is played mostly in the top part of its theoretical range. This makes the sound very intense, but sometimes difficult to control. Special effects, such as the fast lip arpeggio (sometimes called a “rip”), are possible because the overtones are close together in the upper part of the range. The use of the tenor horn instead of the French horn in the brass band is rooted in tradition. One major drawback of the French horn, for many brass bands, is that it is difficult to play on the march. The usual playing position, with the right hand positioned inside the bell, is very difficult to achieve when walking. Brass bands were often (and in some cases, still are) marching bands, so the tenor horn was adopted. The tone qualities of the tenor horn also blend more easily with the other instruments that comprise a brass band.